Food Database – Lose It! used to advertise having about 35,000 foods in its database. It no longer publishes food database size, but based on food vendors added, it hasn't grown much, on our estimates it's about 45,000-50,000 foods. 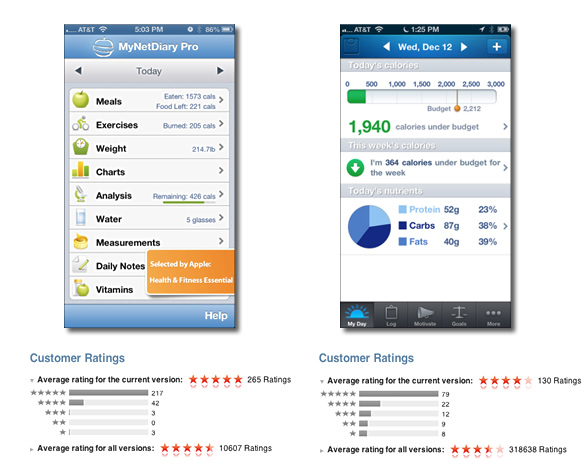 MyNetDiary has 979,000 foods database, and only our team can make changes in this database, improving the food's accuracy and relevancy. Additionally, MyNetDiary Pro and Maximum provide awesome PhotoFood Service – for foods that are not in the database or out-of-date you can send their photos directly from MyNetDiary's iPhone app, which will be verified and entered by MyNetDiary's professional data entry team, resulting in higher quality database.